Majestic and revolutionary multi panel wall map of Paris. This majestic nine panel plan of Paris is the c. 1900 Taride reissue of an important map originally issued in 1652 by Jacques Gomboust. Gomboust held the position of Ingenieur du Roi and, in that capacity completed several important surveys of Paris which eventually evolved into this spectacular map. Oriented to the east, this map covers Paris from the Bastille to the Tuileries Garden and from St. Lazare to the Pont de Faubourg de St. Jacques. This is a geometric delineation of Paris and offers numerous decorative elements, including profile views of all significant Paris buildings. Views of the city itself decorate the upper right and left quadrants. The lower right and left quadrants feature dramatic neoclassical pedestals surmounted by baroque armorial crests. The pedestals themselves contain views of fifteen important Parisian buildings. A textual dedication to King Louis XIV is situated the left. On the right-hand side, notes in French detailing the construction of the map are present and the map is surrounded by a decorative vine motif border. This map is a seminal cartographic masterpiece that bridges the gap between city plans as views and modern maps. All previous maps of Paris depicted the city as elevated profile views - thus anyone looking at the map might recognize this or that building by its well known appearance from the ground. While Gomboust retains this feature with regard to Paris' most important structures, for the most part, he creates a modern map, displaying the city as it would appear from directly above. At the time, this was a very impractical way to depict Paris, for the average person would be incapable of interpreting such a presentation. In viewing such a map, some scholars argue, the typical Parisian embraces the 'King's View' of the city, and thus embraces his authority. This map presents dramatically when framed, either separately or together, in nine tightly spaced panels. It can also be joined by a conservator into a single massive wall map of Paris. This is the c. 1900 Taride reissue. The original 1652 plan is today unobtainable. Jacques Gomboust (fl. c. 1650 - 1670) was a French cartographer and surveyor active in Paris in the middle part of the 17th century. Gomboust held the position of Ingenieur du Roi under Louis XIV, the Sun King. During his tenure in this position, Gomboust produced a number of important views and plans, most of French cities. 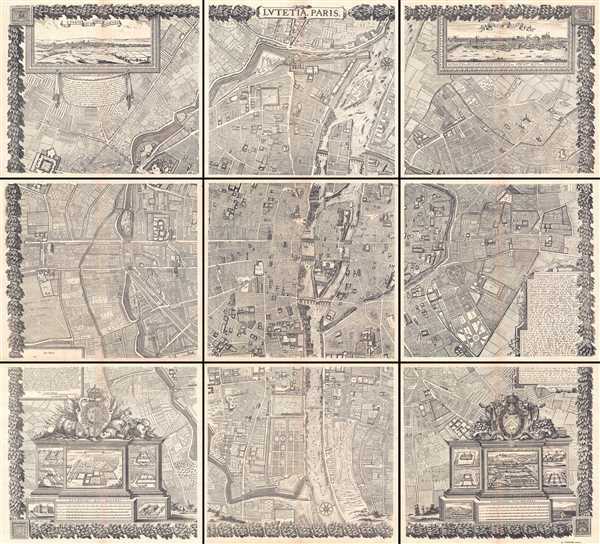 He is best known for his magnificent 1652 wall map of Paris. This map, considered the first geometric survey of Paris, represents a fundamental turning point in urban cartography and in the perception of maps in general. In abandoning the "view" format for a more contemporary top down presentation, Gomboust initiated a new "godlike" way of looking at the world that was, in his day, entirely revolutionary. The influence of this important work cannot be underestimated. Taride, A., Plan Monumental de Paris au XVII Siecle, c. 1900. Very good. Overall toning and brittleness. Minor discoloration along original centerfold on some sheets. Tooley, R. V., Tooley's Dictionary of Mapmakers, pg. 185. Pinder D, 1996, 'Subverting cartography: the situationists and maps of the city,' Environment and Planning, A 28(3) 405 – 427 .